Don’t let the image on the front put you off. Hyappa Ieyasu B poured out a hazy orange brownish colour with a large amount of lively head that was a slight off-white colour. I guess not having drunk too many of these beer from ESB styles, the only one I have to compare it against in Japan is Fuller’s ESB, which Hyappa Ieyasu B looked similar too. However, it had a stronger hoppy and fruity aroma than what I remember – almost verging on phenolic – a most peculiar flavour for an ESB style beer. The body was malt forward, and unashamedly so as well. Hyappa Ieyasu B had strong hints of breadiness to it, and a sweetness that could not be ignored – it lasted from beginning to end, without stopping in between. Heck, it’s so malty that I had no indication of any hops in the beer. If there were, then they should have been signposted as they were missing completely. Hyappa Ieyasu B finished off as it started, with a hefty dose of sweetness that lingered, followed by a faint bitterness. 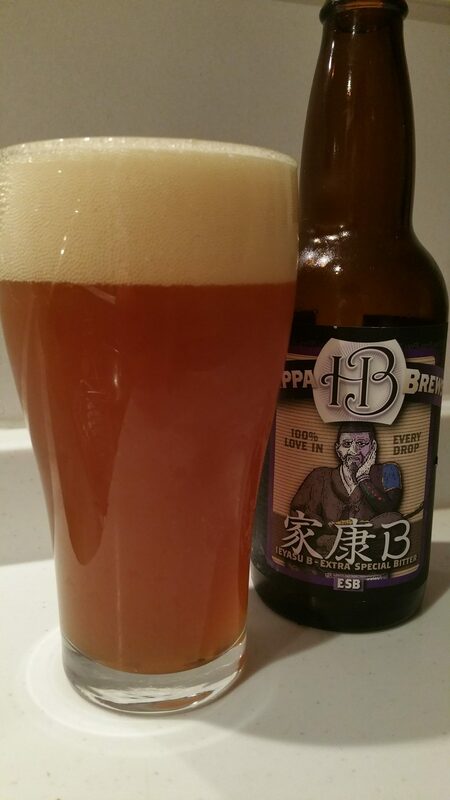 Hyappa Ieyasu B is an ok beer if you like full on malt in your beers. For me, it’s a miss. I usually don’t bother with ESBs cos they get too malty and rich fast. Fullers is a good one but that is also a big one. There should still be a bitterness in there to balance all that malt. I much prefer best bitter or ordinary bitter, myself.